#Focus – Jim Shampine and his Green Machine. – Historic Motor Sport Central. #Focus – Jim Shampine and his Green Machine. 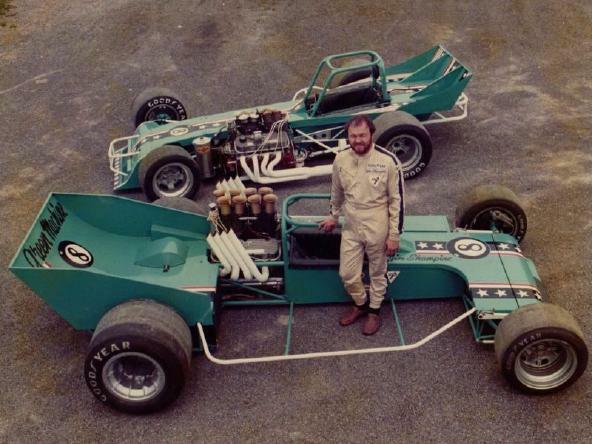 One of the most successful drivers in Supermodified competition and an equally skilled racer in asphalt and dirt-track Modified stock cars, Jim Shampine (March 25, 1941 – September 4, 1982) of Clay, New York, had an innate knack for handling these high-powered machines. Shampine began drag racing in 1959 in Empire State Timing Association events at the quarter-mile ESTA Safety Park Dragstrip in Cicero, New York. 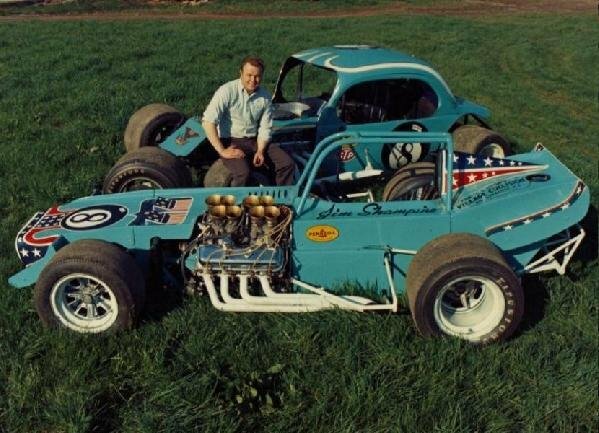 Then in 1962 he switched to racing at the five-eights-mile asphalt Oswego (N.Y.) Speedway after he bought his friend Nolan Swift’s championship-winning Modified and converted it to a Supermodified. And since Swift’s cars were numbered “Ten Pins” Shampine figured “8-Ball” was as good as an identifier as any and that “call sign” eventually became well-known as the one on every car that he would race. Jim and his early “Green Machine”. Shampine won five Modified races at Oswego: 1971’s All-Star League 100 and the track’s Modified 200 Classic in 1971-1972 & 1974. All of these wins came in his Ford-powered blue cut-down asphalt No. 8-Ball Modified 1937 Ford coupe, save for his 1974 victory and the 1974 Oswego Modified title that he won in Ed Cloce’s red No. 69 Hemi-’Cuda. He also ran quite well at New York’s asphalt Fulton, Utica-Rome, Spencer, Lancaster and Shangri-La Speedways. And his Ford-powered blue dirt-track No. 8-Ball Pinto Modified was a multi-time winner and 1970 track champion at the half-mile Rolling Wheels Raceway in Elbridge, New York, and he won several races at the Cayuga County Fair Speedway in Weedsport. Shampine ran in three (1968 & 1970-1971) National Opens on the old Langhorne (Pa.) Speedway’s one-mile “D-shaped” track. In his first two attempts in the 200-miler he finished 45th and 41st, respectively, but on October 17, 1971, he was second in his No. 8-Ball Ford coupe behind winner Roger Treichler in the 21st and last edition of the event on its original home track. 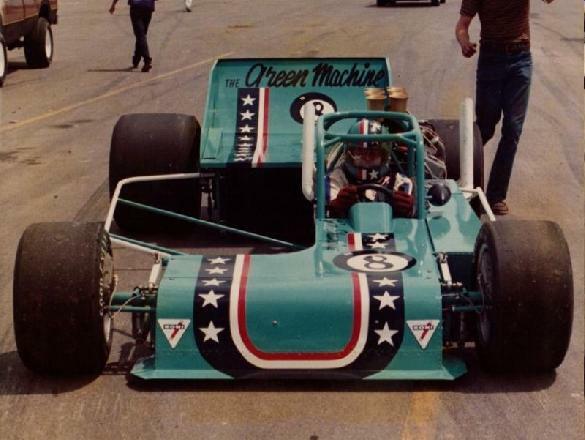 But Shampine really stood out in the slippery Supermodifieds and, as he found out with his Modifieds, by building of his own cars – with their distinctive “Green Machine” paint jobs –he was able to try new things and that proved to be a big advantage and gave him an edge. In 1969, Shampine’s cutting-edge, wedge-shaped Supermodified set a new standard. Then, in 1976, he designed an “Offset Roadster” with its engine mounted halfway out of the left side of the chassis which put 70 percent of its weight where it was best suited for making left-hand turns, and this became the pattern for the modern Supermodified. And he soon followed that idea up with a radically off-set, engine-behind-the-driver, four-wheel-drive Supermodified that raised the bar up at least a couple of more notches before it was banned from competition. 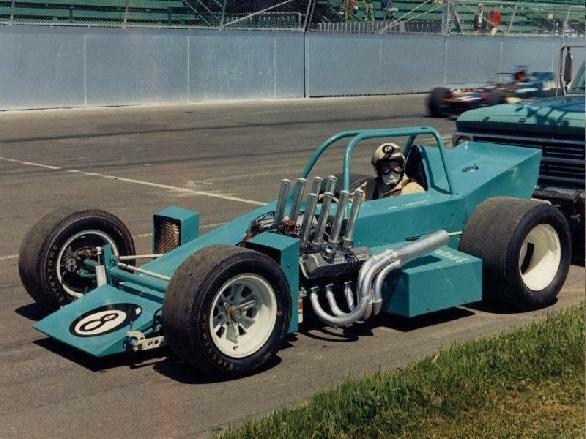 Front view of the first ever “rear-engined” Supermodified. Side view of the first ever “rear-engined” Supermodified. Shampine also had an interest in Sprint Car racing and he showed how quickly that he was able to adapt to this style of competition when he won his very first Sprint Car start with his blue No. 8-Ball D&H Potato Farms entry in a United Racing Club race at Rolling Wheels. 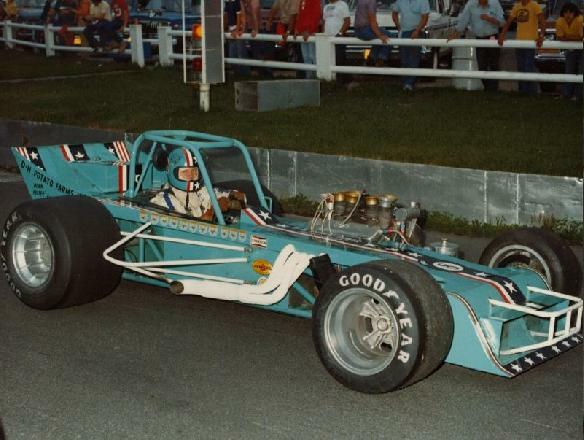 The 1977 International Super Modified Association champion, Shampine won an all-time record of 87 career Supermodified races at Oswego – a record that saw him win 77 out of 206 races there between 1970-1979 for a 38-percent winning ratio and he finished in the top-five another 69 times. He also won seven (1967, 1970, 1972-1974, 1976 & 1979) Oswego Speedway Championships and four (1970, 1974, 1980 & 1982) International Classics at the track not far from the Lake Ontario shore. And his 1980 International Classic 200 victory stands out as the most amazing as he won the race by leading every lap in his No. 8-Ball. Jim and his other “Green Machine”. However, the track where Jim Shampine was so successful was also where his career came to an untimely end as during the 1982 running of the Classic Weekend’s Modified 200 the popular driver suffered fatally head injures when, while driving the No. 99 Modified of Billy Taylor, he spun and his car was T-boned in its left side by the car of another driver. Thank you for a very good post on The Pine! Previous Previous post: #TheThrillOfSpeed – The Gee Bee Model R.
Next Next post: #MotorsportFail – The 1992 WSC BRM P351.